Working from home is an incredible thing. By default, you have the type of freedom and flexibility that a lot of other people can only dream of. You can make your own hours, you answer to nobody but yourself, and it's generally a situation to be celebrated — if you go about it in the right way, that is. The truth is, your incredible new apartment that doubles as your home office can be your biggest benefit or your worst nightmare if you aren't careful. To make sure your situation is more like the former and less like the latter, there are a few key things you'll want to keep in mind. Just because you don't work a traditional 9-to-5 job in the most literal sense while working from home doesn't mean you shouldn't still act like you do. It is in your own best interest to begin each day as if you were still keeping to strict hours. Try to get up at the same time every morning and do the same things you would do if you were heading out to work. Eat breakfast, have your cup of coffee, and take a shower. These early steps of your routine will help get you into the head space you need to be in to take work seriously. Only instead of hopping in your car at the end of it, you'll sit down in front of your computer and get to work. Likewise, don't be afraid to change your surroundings if the need arises. Just because you work from home doesn't mean you're confined there. Grab your computer and go to a coffee shop to eliminate distractions. If you feel like you'd rather be watching television but can't afford the break, unplug the TV from the wall for a while or go to the library for a few hours. Working from home is still work, which means that you need to take it seriously or you'll quickly succumb to temptation and will ultimately get a lot less done than you probably hoped for. 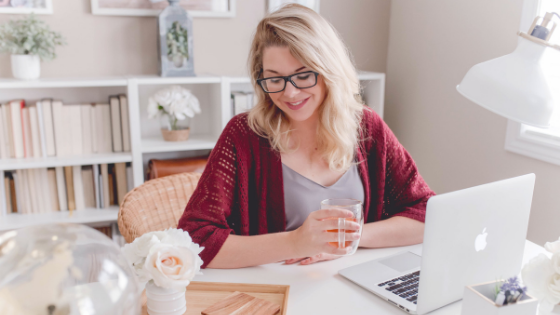 If you'd like to find out more information about how to best optimize your day when you work from home, or if you're just eager to learn about some of the incredible apartments in Raleigh that are available that would be perfect for your next home office, please don't delay. Contact The Tribute today.